Claustrophobic? Experience Anxiety-Free Imaging at Hilliard Open MRI. At Highfield MRI, we are committed to providing you with a clearer picture, period. Welcome to Highfield MRI, the premier Magnetic Resonance Imaging Center serving the Columbus area. Highfield MRI is chosen by doctors and patients alike who seek cutting-edge technology alongside expert analysis to aid in their diagnostic and treatment needs. Our licensed radiographers and board-certified radiologists direct special attention towards patient comfort and care. From same-day appointments to assistance navigating insurance policies, Highfield MRI Imaging center offers Columbus residents better, quicker and more affordable diagnostics across the MRI spectrum. At Highfield MRI, our primary concern is patient comfort. Our imaging center offers a variety of MRI scans, covering the full range of diagnostics that you and your doctor require to ensure excellent care. 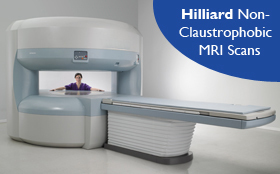 We also offer Open MRI scans on our Altaire high-field performance Open MR system. This allows us to ensure patient comfort in a non-claustrophobic, anxiety-free environment.